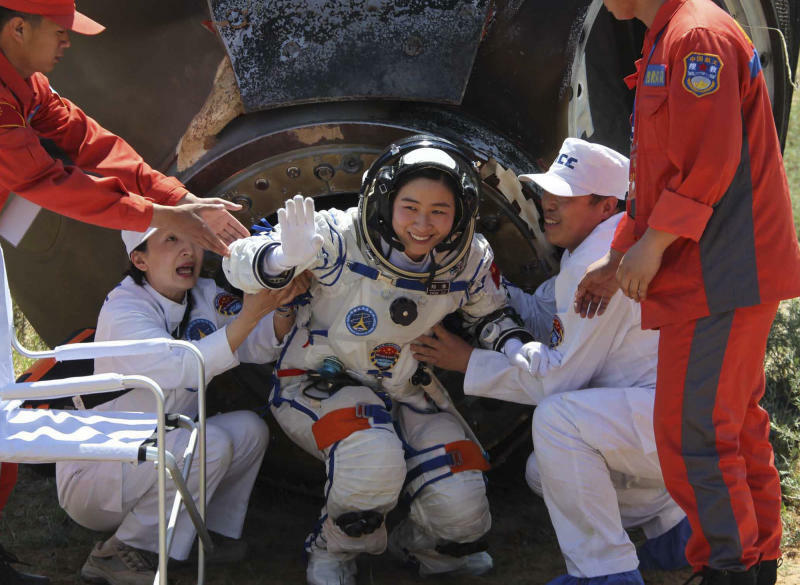 BEIJING (AP) — China's first female astronaut and two other crew members emerged smiling from a capsule that returned safely to Earth on Friday from a 13-day mission to an orbiting module that is a prototype for a future space station. The Shenzhou 9 parachuted to a landing on the grasslands of the country's sprawling Inner Mongolia region at about 10 a.m. (0200 GMT). China declared the first manned mission to the Tiangong 1 module — the space program's longest and most challenging yet — a major stride ahead for the country's ambitious space program. 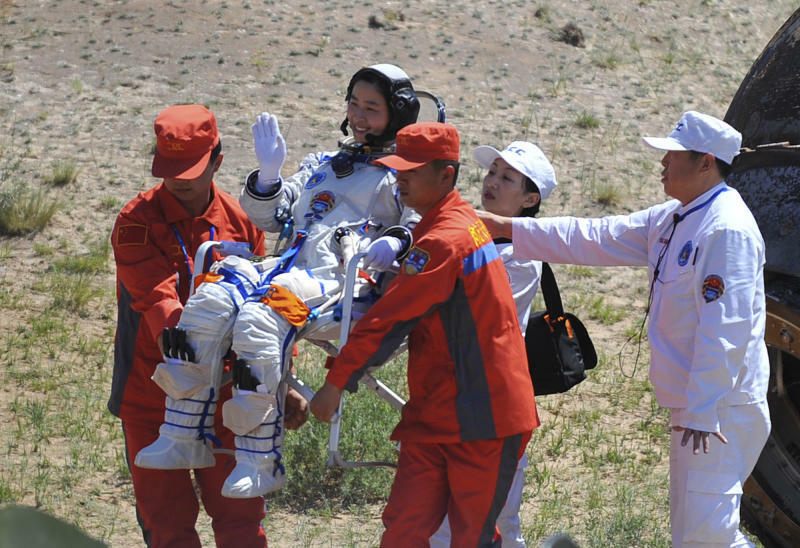 About an hour later, mission commander and veteran astronaut Jing Haipeng, 45, emerged from the capsule, followed by crew mates Liu Wang, 43, and 33-year-old Liu Yang, China's first female astronaut. The three, all experienced air force pilots, were lifted on to folding chairs and appeared in good health. They smiled, waved, chatted and saluted as state television ran live footage from the landing site. "Tiangong 1, our home in space, was comfortable and pleasant. We're very proud of our nation," Liu Yang told national broadcaster CCTV. Space program commander, Gen. Chang Wanchuan, declared the astronauts in good health and declared the mission "completely successful." He was followed by Premier Wen Jiabao, who said the mission marked "absolutely important progress" for the space program. The mission had included both remote control and piloted dockings with the module and extensive medical monitoring of the astronauts as part of preparations for manning a permanent space station. China's next goals include another manned mission to the module originally scheduled for later this year but which may be delayed depending on an evaluation of the Shenzhou 9 mission and the condition of the Tiangong 1. China has been extremely cautious and methodical in its manned missions, with more than three years passing since the previous one, and all four have been relatively problem-free. Chen Shanguang, director for the Chinese Astronaut Research and Training Center, told a news conference that preparations and selection of astronauts were already under way for the Shenzhou 10 mission. Tiangong 1 is due to be retired in a few years and replaced with a permanent space station around 2020 that will weigh about 60 tons, slightly smaller than NASA's Skylab of the 1970s and about one-sixth the size of the 16-nation International Space Station that China was barred from participating in, largely on objections from the United States. Possible future missions could include sending a rover to the moon, possibly followed by a manned lunar mission. Launched June 16 from the Jiuquan center on the edge of the Gobi desert in northern China, Shenzhou 9 is the latest success for China's manned space program that launched its first astronaut, Yang Liwei, into space in 2003, making China just the third nation after Russia and the U.S. to achieve that feat. China would also be the third country after the United States and Russia to send independently maintained space stations into orbit. Earlier in the week, a spokeswoman said China spent 20 billion yuan ($3.1 billion) on its space program between 1992 and 2005 — a rare admission for a program with close links to the secretive military. By the time the next Shenzhou mission is completed, Beijing will have spent an additional 19 billion yuan ($3 billion), the spokeswoman said. Wang Zhaoyao, director of China's manned space program office, said the program mirrors the rising global status of China. 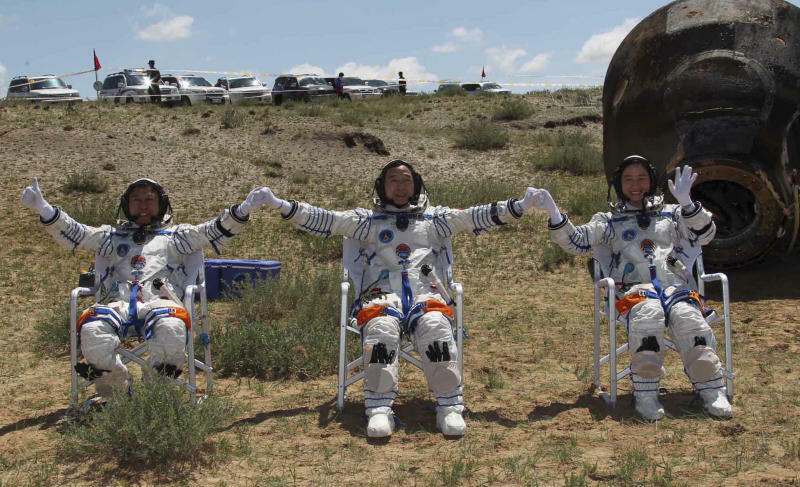 "For any country, for any people, a space program is indispensable," Wang said. Associated Press writer Didi Tang contributed to this report.